Are you considering updating your kitchen with a custom kitchen island? Here are some of the top benefits of installing a kitchen island in your home. For a kitchen with limited storage space, a kitchen island can make a big difference with additional drawers, pull out shelves, and cabinets. Plus, placing a recycling bin under a kitchen island doesn’t interfere with the main preparation area of the rest of the kitchen. A kitchen island is a great place for kids to feel part of the action. It is also helpful during homework time, so parents can keep an eye out while preparing snacks or dinner for the family. Placing items at kid level–like cereal and juice boxes– makes kids feel independent. If you need an informal dining area for the kids, a kitchen island can help arrange them in a space that they can be free. It can also act as additional seating when entertaining many friends. Installing a prep sink and a dishwasher into your island can make your kitchen more functional and useful. Consider moving your cooking area to the island with a stove and hood range, for more counter space to prepare meals. It is easy to pick an island countertop surface that will meet your style and needs. Depending on your preference, you can choose a solid surface of beautiful natural stone or man-made materials that will complement your kitchen’s existing style. 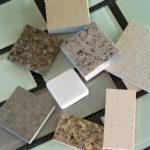 Island Countertop Options can include: Granite, Marble, Quartzite, Limestone, Travertine, Soap Stone, Wood, Concrete, Cambria, Zodiac, Caesarstone, PaperStone, Stainless Steel, Recycled Glass, Corian and Laminate. Let’s Face It can help you design the perfect island for your kitchen. 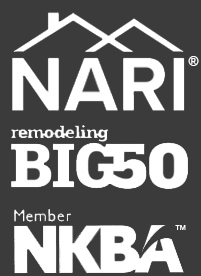 We take care of the plumbing and electric that goes along with it so you don’t have to deal with more work! For the Greater Philadelphia area, contact us at 215-343-2600 today!